According to popular culture, Bigfoot stands 8 feet tall, is covered in hair and roams the woods of the Pacific Northwest. But, in reality, the plaid-suited figure who calls himself "Mr. Link" stands only 16 inches tall, easily resting on a table at Laika studios off Evergreen Parkway in Hillsboro. His cheery smile spreads across its wide face. "Missing Link" the fifth film by Hillsboro animation company Laika Studios, hits theaters Friday, April 12 and has already received wide critical acclaim. Owned by Nike co-founder Phil Knight and run by his son, Travis, Laika Studios has made a name for itself by constantly pushing the envelope for what can be done in the near century-old medium of stop-motion animation. The film centers around Mr. Link, a Sasquatch voiced by comedian Zach Galifianakis, who enlists the help of an explorer Sir Lionel Frost (voiced by Hugh Jackman) to find the rest of his kind in the Himalayas. They are joined by Adelina Fortnight (voiced by Zoe Saldana), who leads them on their journey. "The intention was to tell a story that was equal parts ripping yarn and buddy movie," said Chris Butler, the film's writer and director. "The key to this adventure was not the 'X marks the spot', but the journey itself, and the relationship that forms between these characters. Sir Lionel and Link are an Odd Couple on a kaleidoscopic rollercoaster ride spanning the globe." A decade after the release of its first film, "Coraline" in 2009, Laika has seen widespread commercial and success. Its films have been critically praised, each nominated for an Academy Award for best animated film. Its president and CEO, Travis Knight, has been tapped for Hollywood, directing the 2018 Transformers film "Bumblebee." It expanded its studio space off Evergreen Parkway to be able to work on multiple projects at the same time. The next handful of Laika projects, a closely guarded secret among Laika employees, are already in various stages of development. "Missing Link" is a brighter, more upbeat turn for Laika, whose previous films — while comedic — have always had darker, more serious themes and settings. Bigfoot has long been associated with the Pacific Northwest. Stories of hairy Sasquatch-like creatures appear in Native American folklore and "sightings" of the fabled beast occur every year across Oregon. The famous 1967 footage purported to show a grainy Sasquatch-like creature was filmed along the Klamath River just south of the Oregon border in northern California. Laika specializes in making stop motion films, a painstaking process requiring animators to move the foot-tall-sized puppets a fraction of an inch at a time, photographing them dozens of times to create a single second of usable film. The studio utilizes a mix of traditional stop-motion and computer-generated graphics. Laika artists built 110 different sets on its Hillsboro soundstage, and spent weeks filming each scene. Puppets would be photographed, inched forward, and photographed again. It took an estimated two years to make "Missing Link." "I've always been interested in pushing the boundaries of the stop motion medium," Butler said. "Before Laika came along, the scope of a traditional stop motion movie was always quite small." There are plenty of practical reasons for that, Butler said. Physical puppets being moved on physical sets limit what animators can do, often resulting in smaller stories. "At Laika, we just don't recognize the normal boundaries that stop motion has been governed by for almost a century," Butler said. "So we set out to do everything that could be done in a live action movie, but in miniature. We have all the things that go into making huge Hollywood films. 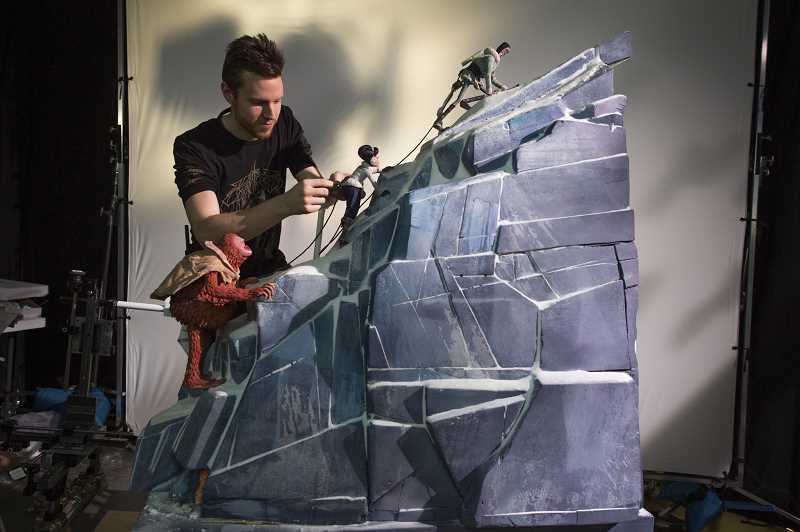 That's why walking around the Laika studio is so mind blowing … People are building sets and props, painting scenery, building puppets, designing and fabricating costumes, figuring out lighting and camera angles." Set designers used plenty of unconventional materials to creating landscapes in the film, including plastic beads, tissue paper, goat hair, foam balls and black light paint. When puppeteers built a motorized model train for the film, they found it ran too smoothly along the railroad tracks. Their solution: lay tiny bits of tape onto the tracks to make the wheels bump along for a more authentic motion. Galifianakis, who has voiced other computer-animated films including "The Lego Batman Movie" and "Puss in Boots" said watching a stop motion film is a different experience. "There's a soul there that most CGI films can't replicate," Galifianakis said. "I was telling my wife last night after seeing the finished film that I really think this could turn into a classic. Not because I'm in it but because of what (Butler) has done here ... In Missing Link, everything was right. I'm very proud of this film." For 2016's "Kubo and the Two Strings," Laika puppeteers had to create some of the largest puppets every made for a stop-motion film, towering 15 feet tall. For "Missing Link," puppeteers made some of its heaviest. An elephant puppet used in the film weighed 36 pounds and used gas-powered springs to help move its massive hips. The film's star, Mr. Link, was another first, said Brad Schiff, the studio's animation supervisor. "We did things with Link that have never been done before," he said. The puppet was equipped with an inflatable balloon inside it, to simulate breathing. And technology inside helped the great beast's belly bounce as it walked. "When Link sighs, he is actually inhaling and exhaling breath," Schiff said. "He also has a belly mover so his large belly could bounce as he walks. He is a funny character and the way the puppet was created helps us communicate that humor. I don't think Link is the first puppet that has ever had a belly mover, but it's definitely the first time we had all these elements in one puppet." The studio also uses a system called "rapid prototyping" to 3D print a separate face for each facial expression used in the film. Animators swap out faces after each shot to make the puppets appear to come to life. It won the studio an engineering Oscar in 2016 for its innovations in 3D printing. "Missing Link" is the first Laika film to use full-color 3D printed faces on all of its puppets. The company's five 3D printers often ran 24 hours a day during the film's production, churning out about 2,000 faces each week. In total, LAIKA made more than 106,000 faces for "Missing Link." "To put that in perspective, our first film, 'Coraline,' had about 20,000 faces for the entire film," said Brian McLean, Laika's director of rapid prototyping. "Our most recent film, 'Kubo and the Two Strings,' had about 64,000." But Butler said he hopes audiences don't notice the technical details of how "Missing Link" is animated. He says the movie's message about finding your place in the world is what audiences will find most appealing. "Fundamentally, the film is about connectivity," Butler said. "It's about empathy and moving from isolation to connection. It has a really potent emotional story at the core, and yet on the top of it we put this beautiful veneer of an incredibly exciting swashbuckling adventure and comedy that harkens back to Jules Verne and Indiana Jones. It's a really cool turn-of-century tale with monsters. I thought that was a really exciting story to tell in animation."